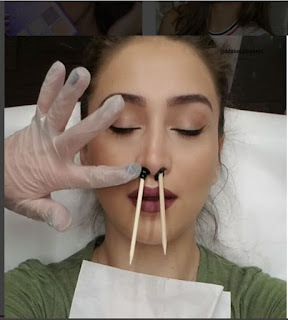 Makeup artist and vlogger Sepi Balini posted a video on instagram showing her nasal hair being removed by waxing. She's made of tough stuff as most individuals would have at least shed a tear given the nose is extremely sensitive, even with pulling just one nostril hair out. Watch the video here. However, this is NOT a good idea and I certainly hope is not something that picks up in popularity whether male or female. Staph in particular likes to hang out among the nasal hair. In very rare cases, an infection in this region of the face (called the "Triangle of Death"), can lead to infection of the brain. Click here for more information on how this may happen. If you want to remove nasal hair, it is best to trim the hair out with nose hair clippers or a scissor.